Previously there had been two attempts to reach this facility. Lt. Col. Gonzales made the first trip in March 2016 had reached the surface of Venus and was directly outside of the facility. He was turned away by the custodian of the facility called the Sentinel, who had expected Goode to be present. In April 2016, Goode was taken to Venus by a spacecraft belonging to the Anschar – the Inner Earth civilization in which Kaaree is a high priestess. 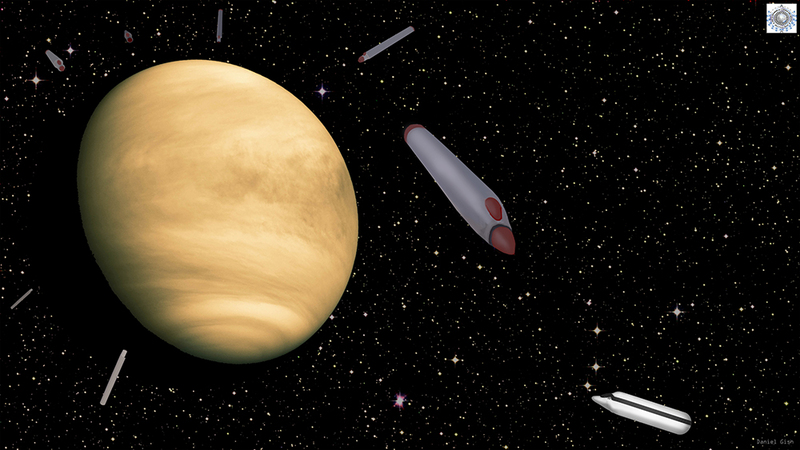 However, before the spacecraft could reach Venus, the craft was intercepted by a number of cigar shaped spacecraft that would not let his craft proceed further. We went through an area in which they are cleared to “punch in and out” of the Earth’s atmosphere by the LOC and other groups that manage air traffic. We seemed to make it to Venus quicker this time, as it was only about a 10-minute flight. We stopped about a thousand feet above the surface of the planet. It was extremely eroded by rain and wind. Some of the mountains had formed into strange shapes that some would think looked a little artificial. The Anshar bus then went transparent, and data began to appear all around me. I looked down and saw the huge H-shaped structure inside a crater. There were also a couple of structures that resembled obelisks, and had what looked like the same H symbols all along them – almost like a totem pole. We were standing in front of a very large entrance into a much larger cavern. Without warning, a 14-foot being appeared before us. He had alabaster white skin, and wore all white. The Anshar referred to him as a “Sentinel.” … He never said a word. Instead, he turned and slightly motioned us with his head to follow him into the larger cavern. Gonzales had not gotten this far during his March visit. Goode then describes how the Sentinel telepathically communicated with him. As we walked inside the structure, the translucent walls began to light up with static symbols all over them. The ceiling inside was over 300 feet tall. The entire structure was well over a thousand feet tall, and ended in an area that appeared to be about 100 feet below the ceiling of the cavern. The Sentinel then reached into my mind. It was more powerful than the Draco White Royal experience, but was not violent or invasive. There were two incidents with the Draco White Royal where first Goode and then Gonzales had encounters, and both described the invasive effects of the communication, and the need to recover afterward. Goode elaborates on the impact of the Sentinel’s download of a lot of information into him. Ever since this experience, I have felt as if a massive zip file has been loaded into my mind. It takes up a large amount of storage space and I do not yet have the password to unlock its contents. The Sentinel then addressed me for one and only one time. He asked, “Do you want the knowledge of who you were, who you are and who you will be?” I was startled by the communication, which I seemed to feel not just in my head but in my entire body. Again I was compelled to answer no. I had been told that the answer would drastically change the nature of all of my personal relationships in a variety of ways that I cannot foresee. This made me feel concerned about my family, among other things. I must admit I was very surprised to see similar symbols appear in a recent crop circle. Even if this formation is somehow a hoax, it may be that the minds of those who created it were inspired by the same consciousness that I had interacted with. As I saw some of the symbols in the crystal pyramid, I had a sudden thought that these were numbers and mathematical formulas. 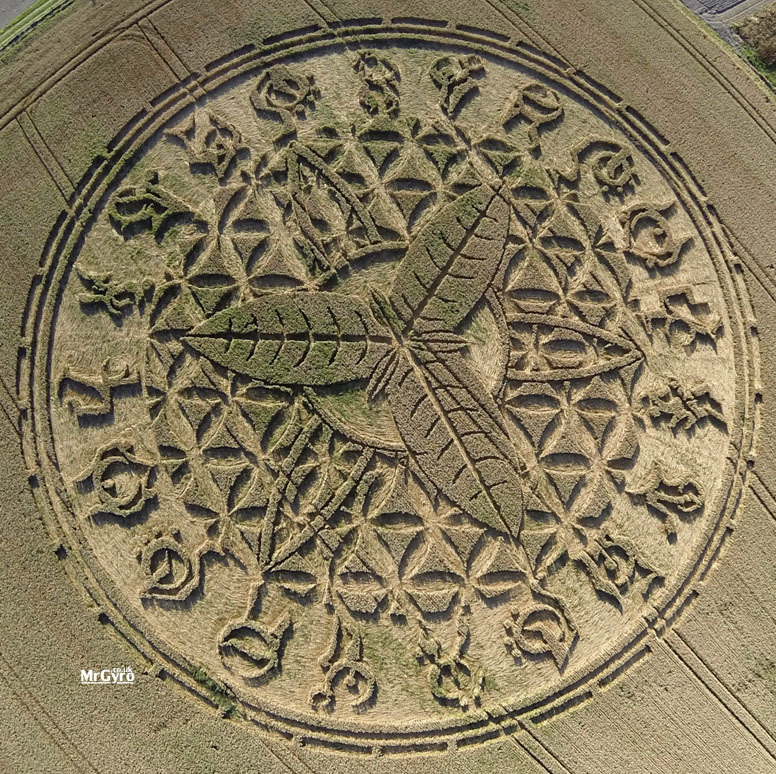 This particular crop circle appeared in Ansty, near Salisbury, England on August 12, and has generated much interest due to its size and complexity. 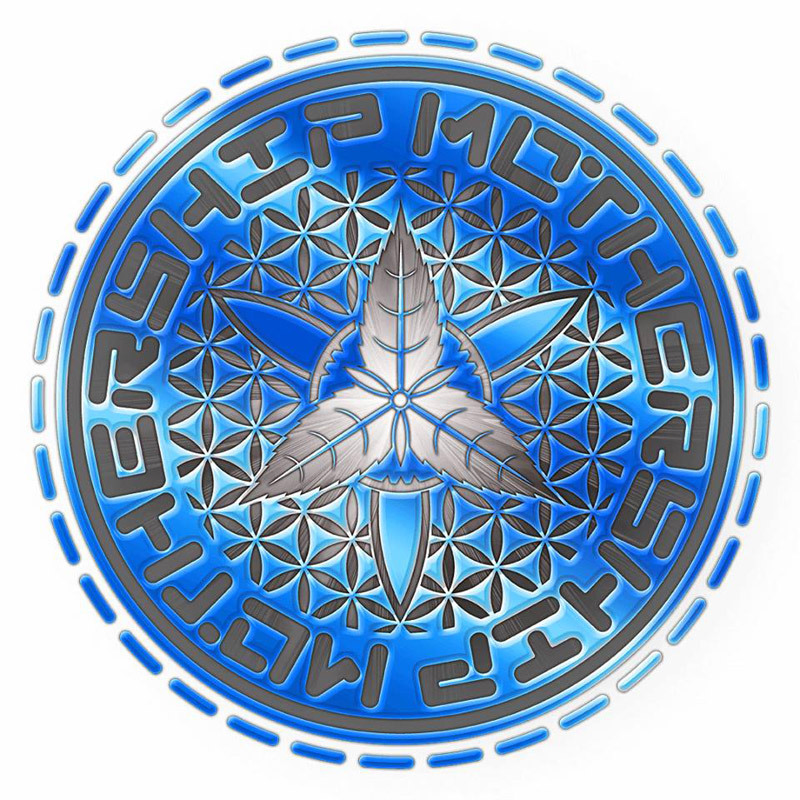 The crop circle has been noted to be based on a logo used by a UK based company called Mothership Glass. This has led to speculation that it was commissioned by the company and is human made. As Goode and others have pointed out, however, even if human made, the inspiration behind it is significant. Goode’s comment that the crop circle was “inspired by the same consciousness that I had interacted with” [the Sentinel] is especially significant. The glyphs around the outer edge, and the peace symbolism all carry a positively charged message that human consciousness can ‘feel’, even without direct understanding by the mind yet. Given what he was told about only .042 percent of humanity being ready for an Ascension event, then it is fair to conclude that the symbol helps the viewer prepare for such an event. She then told me that we were now headed to the Ancient Builder Race (ABR) outpost outside the orbit of Saturn…. We joined the two Anshar pilots that were now inside the Anshar Bus craft. We then exited the caverns below the H structure, and in an instant we were back in space. I could see Saturn, and from what I could judge at the time, it was about the size of a silver dollar. We then entered one of the temporal bubbles, just like the one that I would fly through when going to the Super Federation meetings in approximately the same position around Jupiter. Gonzales had made the same trip after being turned away from the Venus Ancient Builder Race facility, and was once again turned away from the Saturn facility by another Sentinel. As suddenly as in the ABR outpost, another Sentinel appeared in front of us. This time nothing was said. The Sentinel reached inside my mind just as the other one had. This time I saw visions of large spherical objects directing bolts of electricity at huge craft coming into the solar system. Although I could not make out exactly what these spheres were, they could have been moons or planetoids. They were that large. They did not appear similar to the spheres that are visiting our solar system now, and they were much more tangible and physical objects. I observed what seemed like hundreds of scenes of these battles that went by very fast, depicting similar events. Then I witnessed a sphere shoot a bolt of electricity at what appeared to be Mars when it still had an atmosphere and liquid water. The bolt tore through the surface of Mars, creating a huge canyon. The atmosphere was filled with debris that then turned red hot. The debris was blown away from the planet and also rained down upon its surface. The atmosphere was filled with steam. A large amount of vapor was stripped from the planet and turned into ice as it drifted into space. Other scenes then flashed through and I was brought back to Mars. It was now heavily damaged, and was beginning to look similar to how it appears today. I then saw large mushroom clouds appear on the surface as gigantic vessels were fleeing from the planet in all directions. Some of them were headed towards Earth, whereas others were headed in the opposite direction. I knew this was a completely separate incident that had occurred long after the planet’s initial devastation. It appeared to have been a global nuclear war. David Wilcock wrote a postscript to Goode’s report. He points to the many congruities between his and Goode’s information, and why he firmly believes Goode is honestly relaying experiences he has had. 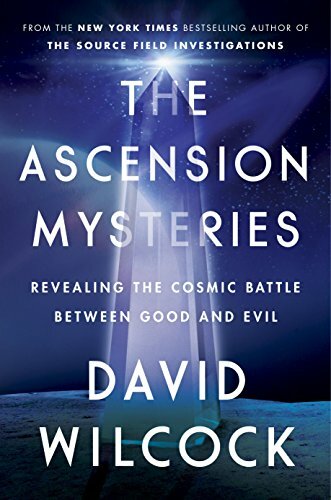 Wilcock will release his findings in a new book scheduled to be released at the end of August, The Ascension Mysteries: Revealing the Cosmic Battle Between Good and Evil. 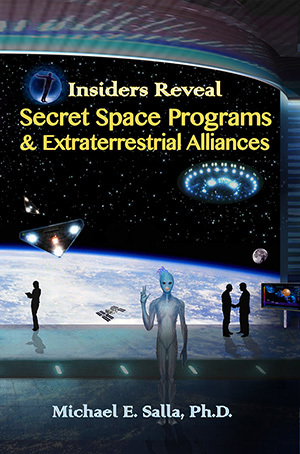 This parallels my own efforts in verifying Goode’s information by cross comparison with other whistleblower testimonies and documents as detailed in Insiders Reveal Secret Space Programs and Extraterrestrial Alliances. As I mentioned in the first article in this series, after more than a year of investigating Goode’s claims, I have yet to find anything that makes me suspect that he is being disingenuous in any way with the information he is releasing. 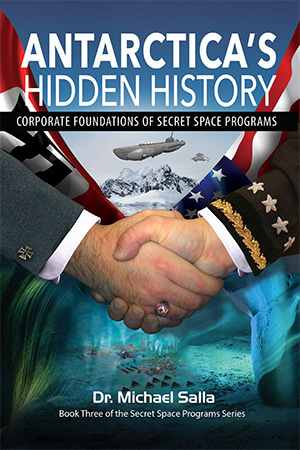 Both of Corey Goode’s August updates, Part 1 and Part 2, contain a tremendous amount of pertinent information about the latest developments in meetings, negotiations and battles between different extraterrestrial civilizations, Secret Space Programs and Inner Earth Civilizations. The most important pieces of information he has shared concern an optimal timeline for full disclosure, without catastrophic manmade events or devastating natural disasters, which require humanity both individually and collectively to courageously explore positive inner potentials that can and will create our reality. In addition to the material presented in both the Seth books and Law of One books, it appears that crop circles, such as the August 12 Ansty circle, by virtue of the inspiration behind their designs, can directly help us feel new dynamic possibilities within our own consciousness, leading to an anticipated Ascension event.